When we pray "Your Kingdom Come", what do we mean? Local neighbourhoods everywhere are affected by global changes, including the death of a single religious vision, shifting work and family patterns, and widespread scepticism. Violence and tension are rising. Churches are taking a lead in community cohesion and transformation. If we are faithful, the future is full of hope. Duncan outlines a "Kingdom approach" affecting every area of community life. From housing to healthcare, from citizenship to crime prevention, ordinary Christians and local churches have a vital role to play. This is a manifesto for social transformation, peppered with examples from across the Western world. Kingdom Come by Malcolm Duncan was published by Lion Hudson in November 2007 and is our 4286th best seller. The ISBN for Kingdom Come is 9781854247988. This is certainly a book for today. It is also not for the faint-hearted – it is an intellectual book with long chapters so it not easy to pick up for a short read. 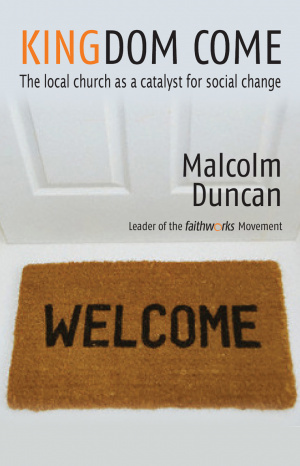 Having said that, Malcolm Duncan, leader of the Faithworks Movement looks at the issues that face Christians and the Church today in a post modern society with pluralistic views, as our world changes drastically from insular small community living to living in the global village. The challenges that face the church in Britain are immense and the statistics about church life make worrying reading. Given that, the author lays out the hope he has for the future based upon our understanding of the Kingdom of God. Once we have understood what we believe based on Biblical principles and not the historical western imperialistic version of Christianity, then we can start to see how the churches to which we belong can impact society through caring for the poor, the downtrodden and those who suffer injustice. He uses examples from around the British Isles showing how different communities are bringing God’s Kingdom to those who are in need and encourages us in our endeavours. An easy-going read, suitable for all who seek to explore Scripture-based ways of strengthening their faith and relationships in contemporary culture. This book catches attention from the start. Suggesting (as does Gerard Kelly in Church Actually) that churches need to place less emphasis on formal gathering (important though that still is) and more on dispersal in the communities in which we live. He explains how this century's culture differs, suggesting we need to explore other images in the bible that better suit today's way of thinking than those used in the past. Showing how to adapt to contemporary need, using "the local church as a catalyst for change" whilst retaining a true biblical approach. Too often we dwell on what divides us. Malcolm Duncan explains why the four commonly used approaches for social action by different faith groups and those of no-faith working together within communities (separation, assimilation, inter-faith and multi-faith) struggle to achieve. Whereas the "distinctive faith" approach encourages recognition and acceptance of differences, alongside finding the factors shared across all groups that help forge positive relationships. We are reminded that statistics are never the full story. Malcolm Duncan points out that millions in the UK have left the gathered church "but not abandoned Christ". They have left because they have "felt constricted, restrained or patronised." Too often being limited to discussions on activities and funds and discouraged from occasionally talking about the Lord we follow. Sadly, many people make decisions about God based on a few bible stories in their early years, church rituals or what others say. (All the great leaders have been misinterpreted over the centuries by well meaning followers). As this author points out, "too many go to the Bible for proof texts rather than reading Scripture holistically and in context." We are so lucky to be able to read the Bible for ourselves. Yet despite in all other subjects continuing to learn and mature, too few read the bible regularly and go on learning God's word to us. There is a way forward. This book is one way to find out! Got a question? No problem! Just click here to ask us about Kingdom Come.